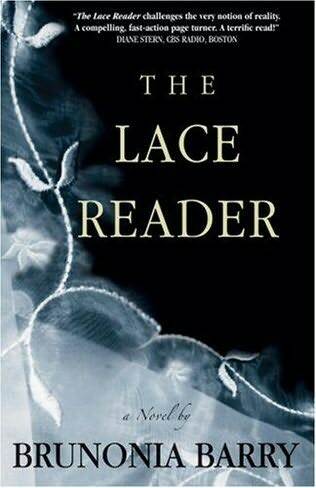 I really didn’t enjoy Brunonia Barry’s The Lace Reader as much as I expected to. I had been hearing buzz about for this one for a while and finally picked it up. I was often frustrated with the story, frustrated with the characters, and sometimes frustrated because I just didn’t care about any of it. The premise sounds intriguing. After the suspicious death of Towner Whitney’s great-aunt, she returns to Salem, Massachusetts and the family and past she’s been running from. The Whitney women read lace, that is, they forsee the future amongst the swirls and patterns. Towner has been running from her gift all her life, but now is faced remembering an adolescence that was so traumatic she’s forgotten huge chunks of it. All the while the investigation of her great-aunt’s drowning continues, and is now possibly related to a missing person’s case. Towner develops an unlikely bond between the policeman in charge, and is forced to confront the people from her past and a secret her subconscious has been repressing all along. I had the twist figured out pretty early on, and not because I’m some genius, but because it could be seen a mile away. And does anyone else despise the cliche of starting a story by having the main character say that he/she is “a liar”? Time and time again I read this, and then never am able to get into the magic of a story, because A) it’s possible none of this is “true” and B) it no longer matters one way or another. I couldn’t get into the Towner character either. She seemed too far off the deep end. While her story was tragic, I felt that she wasn’t someone I could relate to. The best aspects of the book were the expressive ways small town New England life was described. I loved the passages about sailing and island life, about the present-day witches, and the quaint tourist sites. In many ways The Lace Reader reminded me of Annie Proulx’s The Shipping News, only they read ropes not lace. Both described dysfunctional families living a secluded island lifestyle. And since I didn’t care for The Shipping News either, I suppose I should stay away from these types of books. This entry was posted in Best Sellers, Book Reviews, General Fiction and tagged Annie Proulx, Best Sellers, Brunonia Barry, Fiction, The Lace Reader, The Shipping News. Bookmark the permalink.